This guide shows you how to enable 240p output from the Raspberry Pi 2&3. This will allow you to connect the RPi to an RGB monitor for arcade and console emulation. – Raspberry Pi 2 or 3. I recommend getting a good power supply for it. – Pi2SCART from Arcade Forge – Only a SCART cable is needed. Works with all software. If your monitor only accepts RGBs (not RGBHV), then you’ll need a sync combiner like the UMSA, Kenzei, or an Extron Rxi. If your monitor accepts 240p RGBHV (such as some Mitsubishi and NEC monitors), then you can just use a VGA or VGA-to-BNC cable. – RGB-Pi SCART Cable – This is a direct conversion cable that even offers its own software (use the RecalBox installation instructions below, but there’s no need to edit the config file, as it’s already set by the creator). 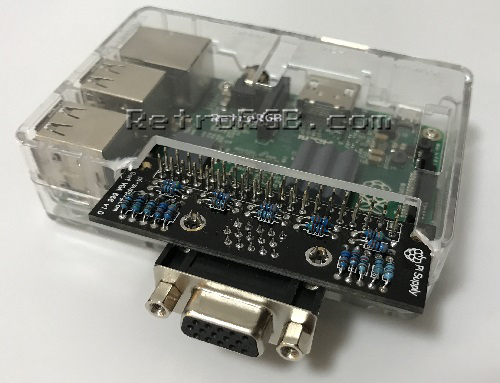 – RPi2SCART – Not yet released, allows for Genesis and Neo Geo controllers to be used. – HDMI to VGA converter – These won’t support custom timings, but if you already own a converter, maybe give it a try? – HDMI to Component – COMING SOON!!! – MicroSD card. I use a 64GB card in mine. – Emulation software. I recommend using Recalbox or Lakka, but this guide will work with many different software packages, including Retropie. – SDCard Formatter I recommend downloading the fat32formatter software as well. 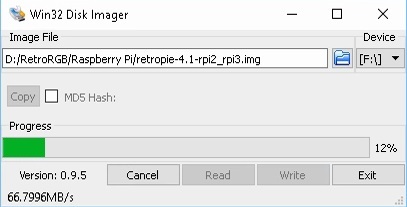 – Win32diskimager for software that requires you to image the SD card (Retropie, Lakka). – Some installations (like Recalbox) will require access to a Linux or Mac machine, or a virtual machine like Virtual Box. – The correct cable to connect to your display (VGA, SCART, etc). If you’re using any of the solutions that plug into the pins (not the HDMI output), these should work for you (installation instructions below). Regardless of what software you use, start by inserting your MicroSD card into your computer and load the SDFormatter software. Make sure to hit the “option” button and set “FORMAT SIZE ADJUSTMENT” to “ON”. – Download the fat32formatter software and extract it to a folder on your computer (I just used the root of my D:\ drive). – Open a DOS window, navigate to where you extracted the file and run the command “fat32format X:”, replacing “X” with the drive letter of your MicroSD card (mine was “F:” in the pictures below). – Hit enter after typing the command, then yes to all prompts. If you get an error, close all Explorer windows (or any program accessing the card) and try again. Click the picture below for a full-sized view. Using this mod with software like Retropie or Lakka is extremely easy! After formatting, simply load the image via win32diskimager (some machines will require you to right click on the icon and hit “run as administrator” for it to launch properly). Once it’s finished, open the SD card and find the file “config.txt” in the root. Open the file, scroll to the bottom and add the code shown above that relevant to your setup. Save the file, eject the SD card and connect your RPi to your RGB monitor. – After formatting, copy the Recalbox files to the FAT32 formatted MicroSD Card. – Eject the card and insert it into your Raspberry Pi. – Boot the Pi with it connected via HDMI to a TV. The first boot must be via HDMI, otherwise it won’t work. – After the software configures itself, it will reboot to the main screen. Do not go any further until you see the main screen!!! – Power off the RPi and insert the MicroSD card into a machine that can read Linux partitions. – Navigate to the “boot” partition and find the “config.txt” file. – Open the file, scroll to the bottom and add the code shown above that relevant to your setup. – Save the file, eject the SD card and connect your RPi to your RGB monitor. That’s it! This page makes it look like there are a lot of steps, but it’s actually pretty quick and easy. By far the hardest part for me was just finding a way to edit the Linux partitions. Once I used a Linux boot CD (or virtual machine) instead of trying other ways to access the card, everything went really quickly. That’s it! Enjoy 240p RPi gaming!!! If you’re done, please head back to the main Arcade / MAME page for more information.